Cacharel Amor Amor is suited for girls who are not afraid to show everyone what they are. Cacharel Amor Amor 100ml. 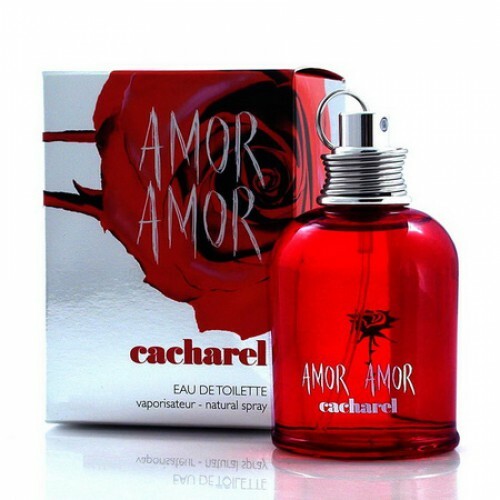 Eau De Toilette - Cacharel Amor Amor is literally the elixir of love for women and girls who yearn for a love adventure. Alluring aromas of citrus fruits - oranges, mandarins and is shrouded in a mysterious veil of sandalwood and musk and invites you to flirt. Floral fruity fragrance suitable for all seasons - love does not wait! Try scent that men head-turner, and you will start to fall at his feet. Cacharel Amor Amor fragrance is suited for girls who are not afraid to show everyone what they are - a playful, provocative and seductive. Even the actual seal, waiting to unlock it and draining into your dangerous world of magic, which now no one can resist! Sweet, passionate, compelling and provocative - just Cacharel Amor Amor. Fans of the mysterious, alluring aromas come to the delight of the exquisite delicacies created by the famous French company Cacharel. One drop of this perfume, dissolved on the delicate female skin, draw the attention of any man, causing him to fall unconscious. The name of this miracle elixir - Amor Amor. Eau de toilette, sparkling playful chords citrus and berries, fills the heart with his young owner of lightness and freshness. Flower-Fruit composition begins a bitter-sweet scent of grapefruit tart with a hint of blackcurrant. "Heart" Amor Amor string covered in a soft combination of fresh lilies and delicate jasmine, wrapped in mouth-watering smell of ripe apricot. The composition is completed spicy-tart fragrant trail of musk, tonka bean and sandalwood stupefying with the finest sounding vanilla. Subtle and unobtrusive Amor Amor is perfect for an energetic young girl, he will give a special appeal, emphasizing her personality and temperament. A sparkling, fruity, floral velvety soft * Note * passionate, impulsive and sensuality of mandarin, blackcurrant, Melati flower, Lily Of The Valley * Blended with White Musk, Ambergris. Perfect for day or special occasion. Amor Amor smells of desire and passion women who wear this fragrance are guaranteed an exciting and passionate night. They show courage and confidence, they also left a bold impression. Amor Amor is a fruity floral fragrance from day 100% Interesting aromas: red rose, vanilla, lily of the valley, sandalwood, white musk, ambergris, grapefruit, blood orange and mandarin.